Getting your mind right for back to school and all of the routine it brings can be stressful after a few weeks of leisurely coming and going. Calculating bed and wake up times, thinking of lunch box ideas, coordinating drop off and pick up times. Back to school time is a lot, especially when you have more than one child. Setting a plan in place ahead of time, really helps to keep things running smooth during the week. As cumbersome as sitting down once a week and planning seems, keep in mind your children will likely be calmer and on a routine that ensures they get enough rest and aren’t rushed through things. Here are just a few things that I do to stay organized throughout the school year. I’m constantly tweaking the plan based on what’s working and what isn’t based on activities and the season but these actions are always in some type of rotation around our home and they really and truly help keep me sane. Yes. My inbox is ridiculous. With school budgets getting cut and the increased adoption of technology more and more correspondence is being sent through email. I appreciate this because it keeps paper clutter in my house to a minimum and I don’t have to worry with physically keeping up with things. Before you go all don’t add another thing to my list just think about the fact that something important like 50’s dress up day may go unnoticed among your Gap sale email. I’m pretty sure this goes without saying but please make sure to check the email, like set it up to push to your phone OKAY. 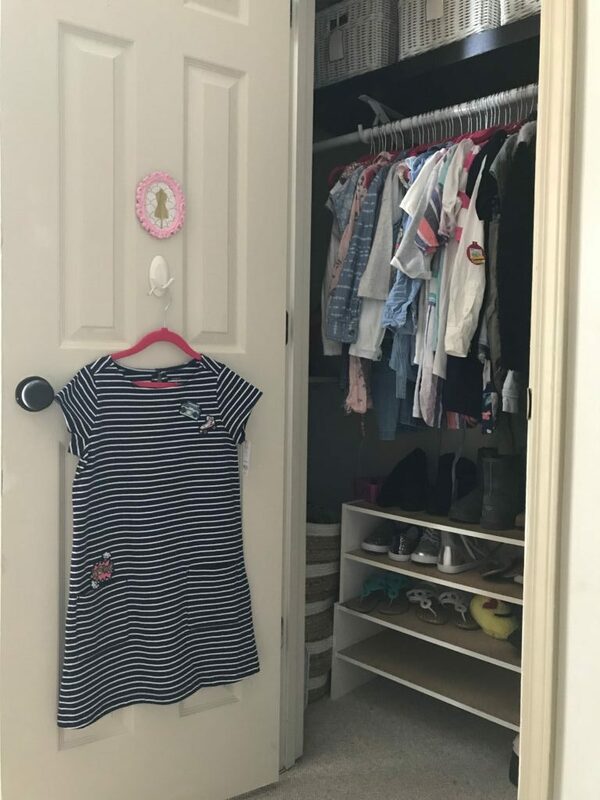 My daughter is not tall enough to reach her hung clothing so I took a command hook and affixed it to the inside of her closet door. Nightly I place her clothes on it for the next day. One less thing I have to do in the morning and it allows her to get dressed without my help while I pack her lunch. For children that are old enough to take some responsibility in getting themselves ready for school post a fun check off printable they can use daily. This super cute morning printable from Baby Shopaholic makes sure your little one knows what to do daily. Don’t just meal plan, meal plan with a purpose. Kids have activities on Wednesdays? Plan a crockpot meal for that day. Eating out is such an easy and expensive cop out. One thing I am going to try my hand doing is cooking 2-3 meals on one day which means I would only be in the kitchen actually cooking a few days a week. Ironing/laying out clothing, combing hair, signing all paperwork in advance for the week when feasible, laundry, creating snack baskets, and creating chore lists are great activities to batch on a free day to save you time during the week. My children like fresh pancakes, sometimes I batch cook them so they can easily reheat them in the mornings or I make these for and easy heat and eat breakfast. Don’t force yourself to have to remember everything. Set reminders on your phone to keep you on top of the little things. I am notorious for forgetting to make my son practice his piano. I have a reminder set for when he has to start and another for when he can finish. Set one for when it’s time to start homework, dinner, leave for practice or for that daily activity you have to do that constantly slips your mind. Over time you won’t need it but its great to not have to remember those things. I’ve also found it easier to input a date or reminder in my phone at the moment I find out about it. It is so easy to say I’ll remember or I’ll do it later. The few minutes it takes you to do it right then will remove one more thing off your list of things to remember. As we all know back to school time is multi faceted. It isn’t just lunch ideas, and getting organized. It’s adjusting to new grades and school transitions. It’s finding snacks that work for children with food allergies. The Fab Five and I are happy to bring you this Back to School series to hopefully give you some ideas on how to be ready for back to school. Be sure to stop by the other ladies for additional tips and tricks for back to school! I love the command hook idea! This is genius. We will be moving into our new home the week that school starts and I’m already planning their routines and mapping out the homework room. Thanks for the TIPS!! No problem! So excited for y’all. Getting the kids involved…you can write an entire post about this one! I’m sure there are so many ways you can turn this into a fun activity. Looking forward to your posts as always, thanks for sharing!! Love the command hook for the little ones! I really like the shoe rack in the closet. Where did you happen to find that? Hey! I repurposed that shoe rack. When we took out our old closet in the master they were a part of the system that was in there. Instead of throwing them away I just repurposed them in there. I think you can find them in Lowe’s and Home Depot in the build a closet aisle. I do plan on painting them.